"Born in 1968 in Okinawa prefecture. His independent film ""No sense of rhythm"" won the grand prix at Hayashi Kaizo Award organized by Shogakkan Inc.. At 4th Japan Scenario Competition, ""Floating Weeds"" won the encouragement award. At 3rd Atouda Takashi Horor Short Novel Award, he won the best award with ""Relief"". In 2012, ""Mother of the Groom"" won the Minister's Award, the Ministry of Land, Infrastructure, Transport and Tourism at Short Shorts Film Festival & Asia 2012, Honorable Mention Award at Rochester Int'l. Film Festival. In 2015, he won the best short award with ""Karama Blue"" at Short Shorts Film Festival & Asia 2015, Golden Zipangu Award at LA EigaFest. In 2016, his feature film ""The man who changed Okinawa"" based on the real baseball team and coach, Hiroyoshi Sai was released. 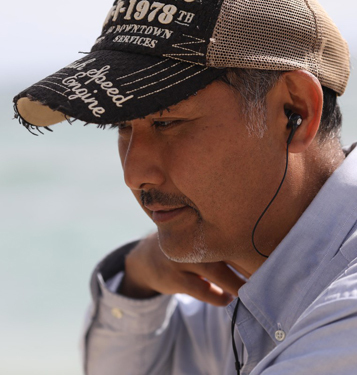 Now he is on the editing of Taiwanese-Japanese film ""___"" and a feature film ""Karama Blue"" based on his short film with the same title. "